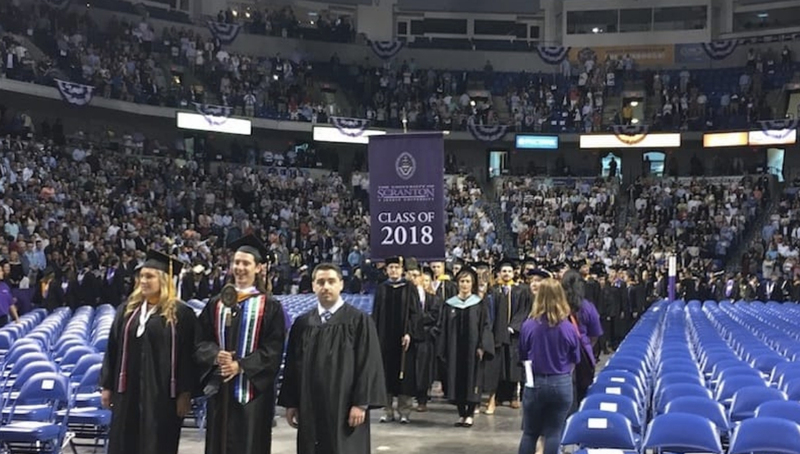 Ninety-eight percent of The University of Scranton’s undergraduate class of 2018 and 99 percent of its graduate class reported being successful in their career goal of employment or pursuing additional education within six months of graduation. Ninety-eight percent of The University of Scranton’s undergraduate class of 2018 and 99 percent of its graduate class reported being successful in their choice of career path of either employment or pursuing additional education within six months of graduation. The “First Destination Survey” report by Scranton’s Gerard R. Roche Center for Career Development is based on career success data obtained about 79 percent of the undergraduate class. This “knowledge rate,” or percentage of graduates for whom their career outcome is known, far exceeds the National Association of College Employers recommended rate of 65 percent. The knowledge rate for members of the University’s graduate class of 2018 is 68 percent. For members of University’s class of 2018 earning a bachelor’s degree, 97 percent were successful in obtaining their goal of full-time employment, and 99 percent were successful in obtaining their goal of attending graduate or professional school. The average (mean) salary is $51,282, based on the bachelor’s degree graduates that provided salary information. The average salary varied by major. The highest average salaries reported are in electrical engineering ($70,625), strategic communications ($63,000) and nursing ($61,529). Geographically, of those employed, 81 percent reported working in Pennsylvania, New York and New Jersey. Additionally, the report for undergraduates shows: 48 percent are employed in full-time positions; 47 percent are pursuing additional education; 3 percent were employed in part-time positions or pursing another intentional career path as defined by the graduate. Seventy-nine percent (79%) of the Class of 2018 completed at least one experiential learning opportunity during their education at Scranton. Of those employed, 71 percent are working in Pennsylvania, New York and New Jersey.